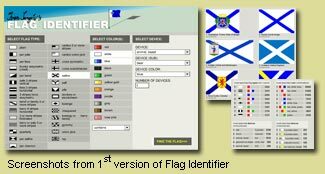 Flag Identifier is a web tool for identifiying different flags regardless of usage, geographic descent or and historical background. It consists a large database of relevant facts about flags. First version was made in 2003. This version was developed during 2006, and is online since 16-JAN-2007. Data are collected with permission mostly from Flags of the World website, as well as from vexillologic literature. Contents of the database are maintained by FI editors. There are 1282 flags in the database as for today. Images by FOTW editors and contributors: Graham Bartram, Erik Bell, Jorge Candeias, Blas Delgado Ortiz, Fred Drews, Carlos Esparza, Mario Fabretto, Juan Manuel Gabino Villascán, Pierre Gay, Martin Grieve, Pascal Gross, Antonio Gutiérrez, Dov Gutterman, Zachary Harden, Željko Heimer, Alvin Helms, Zoltán Horváth, Eugene Ipavec, Elena Kalianova, Adam Kromer, Arnaud Leroy, Carsten Linke, Sam Lockton, António Martins-Tuválkin, Joseph McMillan, T.F. Mills, Edward Mooney, Vincent Morley, Clay Moss, Stuart Notholt, Jaume Olle', Calvin Paige Herring, Marc Pasquin, Jens Pattke, Gvido Petersons, Suttipong Phuensaen, Mikhail Revnivtsev, Ivan Sache, Ivan Sarajčić, Dirk Schönberger, Marcus Schmöger, Falko Schmidt, Stefan Schwoon, Mark Sensen, Dean Thomas, Carlos Thompson, Tomislav Todorović, Peter Hans van den Muijzenberg, Andres Villaveces, Raphaël Vinet, Rick Wyatt, Charlotte Zakharian Jones.